Summertime growing up meant running barefoot through the field behind our house, my long straw-colored hair trailing behind. My sisters and I would hide in the cornfields, getting lost among the tall stalks, pretending we were vagabonds. Our tall red barn served as the base camp and sheltered us in our play during summer rains. During the hot humid days, we would traipse behind my mother, four, and then later five, girls carrying buckets to pick the garden’s bounty. Some days we’d visit a nearby U-pick farm, other days we tend to our own garden. I’m sure there were many times I was less than helpful in the weeding and watering, but the picking I enjoyed. It meant strawberry shortcake on the back steps after we’d spent hours picking in the hot sun, washing, and de-stemming the berries, and washing up in big buckets outside. Picking produce also meant spending an entire day canning so much salsa that our eyes would burn just by walking into the kitchen. My favorite of all was the picking that led to dill pickles. My mom would take the freshly picked cucumbers right from our garden and make the most wonderful tasting pickles – better than anything found in stores. I, along with my sisters would dig into the big one-gallon jar she’d make them in, they never lasted long once they got into the fridge. She has had this recipe for dill sun pickles for ages, and I have to say they’re still my favorite almost three decades later. Everyone we’ve ever given them to has liked them so much they ask for the recipe. ***UPDATED TO ADD – There are also many people that are worried about leaving these out, and I constantly get comments on this post about how this recipe does not meet current food safety standards (it most likely doesn’t). 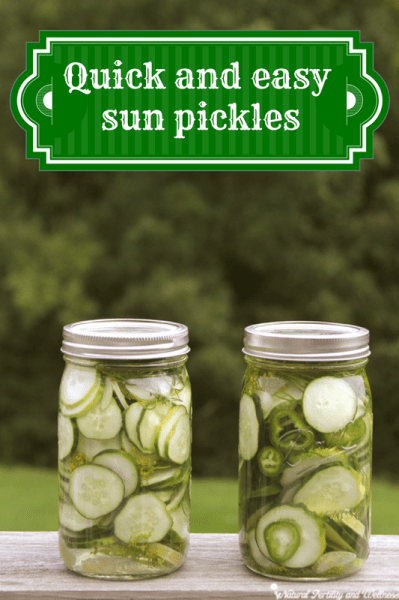 That said, I still take the risk and make pickles this way, BUT you can just as easily make these in your refrigerator! The only difference is the skins aren’t as “bleached” and thin, so you can leave them on or peel them before making if you prefer. Just add everything to the jar and let them sit in the fridge for a few days. A classic and easy to make pickle. Wash and sterilize (with boiling water) 3 or 4 quart sized mason jars and the same amount of two-part canning lids. Either slice or spear each cucumber. I like my slices to be about 1/4 inch thick. 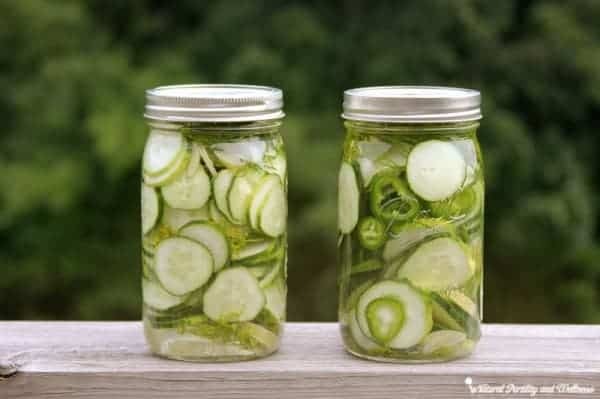 Repeat layering by adding more dill, garlic, and more vegetables and pour water/vinegar mixture over cucumbers and place the two-part lid on the jar. Make sure to jot the date you made them on the lid so you can eat them in the order you made them. Set out in the sun for 3-4 days, giving them a small shake each day, chill and enjoy! Instead of leaving them to sit out, feel free to pop them in the fridge and let them sit for 3-4 days. You can easily make these pickles without onion or jalapenos, or you can vary the flavor based on your preferences. If you don’t like to munch on the pickled onion, garlic, and jalapenos, they are fabulous chopped up and put into a hamburger! Many people say to cut off both ends of the cucumber for best results. I naturally do when I make slices, but never have when I do spears and they still turn out fine. If you’re a better safe than sorry kind of gal, just trim both ends off. No harm done. If you don’t have mason jars, you can use any glass jar you have that has a lid. The jar can also be just about any size, but I prefer the quart sized jars as the fit nicely in my refrigerator. Do not open the lid to taste test during the 2-3 days period, not even once, and not even if you really, really, really want to try them! Only open and enjoy when you’ll be eating the entire jar within the week. Opening the jar is an invitation for bacteria to enter and then leaving them un-refrigerated will be the breeding ground. The sunshine isn’t necessary for flavor, so if you don’t have space outdoors, or if the sun has been hidden by clouds, no need to worry. Personally, I love the sun part of these pickles! It bleaches the dark green skins, leaving them almost white. The skins will also thin and soften a bit, taking the toughness out of them, so there is no need to peel before making! These dill sun pickles will last for some time in cold storage, I often make them in the summer and we eat them until Christmas. Just don’t open the jar until you’re ready to eat them and then do so within a week or two. I think the "faded" look may come from the vinegar destroying the clorophyll. My indoor pickles also lose their bright green color and have a more olive green appearance. 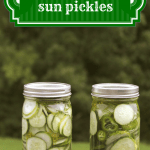 Perhaps sun pickles look even more different than that, but there's my two cents. I do heartily agree that homemade pickles are the best! I’m trying to research pickling for next season and came across your recipe. It looks good but aren’t you concerned about the use of alum? While this food additive is approved by the FDA it has been shown to be toxic in doses as small as an ounce. @Lauren, Lauren, I have yet to try this recipe w/o alum, but this is one of my ‘better than store bought’ recipes. It hasn’t been heated and doesn’t contain dyes. And an ounce of alum is a lot!! I have a small 1.9 ounce jar of it and I’ve used it through 4 pickling seasons, making about 2 dozen quarts per year and have yet to even make a dent in the jar. I just looked and it seems I haven’t even used an 1/8 of the jar yet. And yes, I am always concerned about the use of ‘preservative’ type ingredients in any of my food! Sometimes though it’s all about progress, not perfection. And while one day I may get to food ‘perfection’, right now I’m still in progress mode! Personally though, next summer I would like to try naturally fermenting my pickles! Ahhh yes. I think I mentioned that in a comment awhile back but must not have redone the post. Thanks for the reminder! I just tried this recipe and wanted to let you know it works GREAT withOUT the alum. I just left it out because I didn’t have it and didn’t feel like a trip to the store. They’ve plenty crunchy. Excellent recipe! Just to double check – Are these refrigerator pickles that you are not actually “canning” or “sealing” these jars and it is safe to leave them out in the sun for a few days. I am looking for recipes that I don’t have to seal. Thank you – the recipe looks great. @MomOfFour, No – these are not sealed or ‘canned’. Leaving them out for 3 days allows the pickles to ferment and as long as you don’t open the jar, they will stay fresh in the fridge for months. As soon as they are opened, they last a week or two. also- you don’t really have to put them in the sun, leaving them on the counter works just as good. I like them sun bleached though and it seems to make the skins softer! I made these pickles last year. (without alum) I stored them in my basement on shelves and we just finished the last jar last week, Not only did they last an entire year, some jars were in my fridge for over a month (after they were opened) before the were all eaten, They lasted, no spoilage, no food poisingin. My great grandma said this is how they were done and kept for centuries before modern conveniences. She was right. These were way to salty but smelled good. Can I reduce the salt? @Net, You can try – but they may not preserve as long since the salt aids in keeping them longer. If you’re going to consume them within a few weeks, it shouldn’t be a problem though as long as you keep them cold after the first few days. @Sarah, 3-5 quarts I think, but it all depends on how you cut the cucumbers. Sliced, you’ll fill the jar a bit more and use less of the liquid. Spears seem to need more liquid per jar. After years of my 2 younger brothers making crock dill pickles, this believe it or not is my FIRST attempt at making pickles! I loved making them and can’t wait to make more! I am going to add though a jalapeno pepper to this next batch and see how they come out. Anybody ever do this? Somebody else said chiles too. Did any body elses garlic turn blue though? I freaked out and about cried when I saw that! Went right to Web and looked it up and found out it’s not harmful. Whew, I was so happy to read this. So today after making them about 330pm Sunday I brought them in the house Tuesday night, feared about storms coming thru OH damaging my hard work! This morning I ate one, I opened the sliced jar and ate one and it was fantastic!! They came out really great! So glad I went and did this. Easy peasy! Just wondering. does the dill have to be fresh or can I use dried? Dont want to go to the store. lol! And can use reg salt or does it have to be canning salt? Thanks! Dying to trythis since I just got some canning jars! @Diana Garcia, I’ve never used dried dill, but i do think fresh will definitely make a better product, as will canning salt vs regular salt. I’ve used coarse sea salt with decent results, but canning salt does make it look more appealing since there are no impurities in it. Just thought I would post that an alternative to Alum in pickles (for crisping them) is to use 1 fresh grape leaf per quart. These were the most fantastic pickles i’ve had! A great change from the regular Dill Pickles <3 Thanks for sharing! Just did this yesterday and yielded 18 wide mouth pints; 9 spears and 9 sliced. I did one dill head per jar and 1-2 cloves of garlic. I also chopped up a total of 5 jalapeños and rationed them throughout. I use kosher salt for everything and it works great. I cut them up into the juices and let them sit awhile before jarring and they already tasted wonderful! I’m also working on some freezer bread and butter pickles. It’s amazing what a $5 box of cucumbers will get you! I just found this recipe and would like to try it, but first a fast question.. It says you can store them for 6 months? Without a water bath? Confused! These are cold storage pickles, not canned pickles. So after sitting for a couple days you’ll need to keep them in the fridge or cold cellar. Does this recipe work with whole cucumbers, not slicing or spearing? Also I tried “Babbles” fermented pickle recipe and way to salty but also did not contain vinegar. Excited to try. @michelle, I’m sure you could try them whole, but I’d at least slice them in half the long way. You’ll fit more into one jar and they’ll absorb more of the flavor. 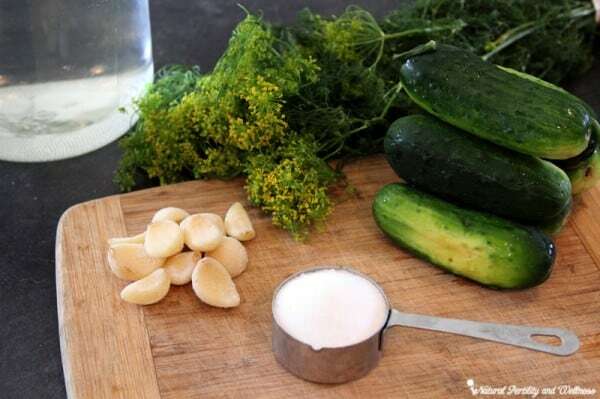 My husband has made four bathes of these dill sun pickles and they are sooooo good and crunchy. He sliced the cucumbers thick and he tried the spears, but I prefer the sliced, we are very impressed on how crunchy they are. This recipe is not safe. It does not state the correct amount of acidity needed for the vinegar (which is 5%) but also, this is not the proper way to ferment pickles. In essence you are canning bacteria which can be harmful. @Erica, Thank you for your concern. I will be leaving this comment on the blog because I can always appreciate another person’s opinion, but I will be editing it so that it takes the tone of teaching and common respect – something I make sure all comments on this blog abide by. And if I were to make pickles another way it would be through lacto-fermentation, were I would be specifically breeding good bacteria to preserve them for cold storage. I have taken a food safety class and I agree with the previous persons response (Erica). @Eliza, Thank you for your concern. I will be leaving this comment on the blog because I can always appreciate another person’s opinion, but I will be editing it so that it takes the tone of teaching and common respect – something I make sure all comments on this blog abide by. Donielle, just to make you aware, currently there are no research-based recommendations for pickles to remain in the refrigerator for weeks. 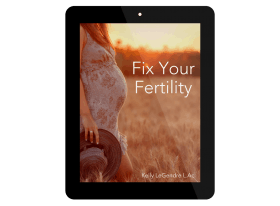 The reason being that Listeria grows at cooler temperatures, and with the open-kettle method that you are recommending on your site you are recommending potentially dangerous foods to pregnant mothers. I believe you are aware, but pregnant mothers are an at-risk population in regards to food safety concerns. I highly recommend looking at recipes that are research-based and are guaranteed safe, to be posting on your blog. Please take this information as an educational and respectful tone because currently there are several safety concerns with the recipe listed above. @Erica, I do understand where you are coming from, but I have also found that more traditionally prepared foods are healthier for us than our modern processed foods. So much of what I prepare in my home would not be recommended by the FDA or USDA – two agencies that I feel have done more damage to our food supply than they’d like to notice. Your thoughts and ideas have made me add information about food safety into my disclosure. 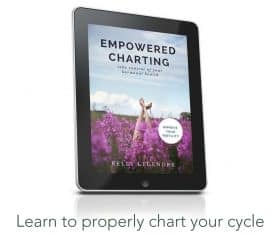 Especially for those who just happen to stumble across my site because of a recipe and don’t necessarily adhere to the same dietary guidelines of the traditional food movement like I do. Wow. I have to put in my two cents worth concerning the food safety issues and defend our friend donielle. I have made and eaten sun pickles nearly all my life. This is almost the same exact recipe as my great grandmother’s. I’m sure it probably came from her ancestors as well. I’ll be 55 next week so I’m talking about a lot of years!? I believe that the recipe clearly states that these are cold storage pickles. You can’t keep them on a shelf in your stockpile. Vinegar and salt are natural preservatives. As I said, ii have eaten these pickles all my life. Anytime you can use a time honored homemade recipe instead of a store bought product, you are doing a good thing for yourself and your family. @Denise, I have no idea how they’d turn out after canning. usually refrigerator pickles and canned pickles have slightly different recipes. I’d check out a recipe at http://www.simplebites.net or http://www.foodinjars.com for a canned recipe – you might be able to just modify them a bit before canning. Why use vinegar at all? It destroys the probiotics all together. Has anyone tried without vinegar? Yes, it does. As I mentioned in the post these are not traditionally fermented pickles (as I don’t yet have a good consistent recipe that’d I’d like to share). But they are my favorite because they remind me of my childhood. These can be done without vinegar, but the salt content is probably different. http://www.GNOWFGLINS.com is a great resource for properly fermented foods! Hi! Thank you for this recipe!! A friend of mine made sun pickles and I thought they were the most amazing pickles I’d ever eaten. But when I tried these after making them, they came out sooo salty. Did I do something wrong? And I saw comments about making this with alum. I didn’t see that in the recipe?? Is that what I did wrong? The saltiness would just be due to the amount of salt added in the recipe. (The salt also helps inhibit bacterial growth a bit – so keep that in mind as well) Making sure the salt is fully dissolved helps in ensuring that one jar isn’t saltier than another too. My husband made these for the first time this past summer, and everyone has loved them. Now he wants me to save the brine (in the frig) so he can reuse it for next summer’s batch. Is that OK? I have no issues as some others on your site, but reusing for a fresh batch…I’m not sure. I definitely wouldn’t keep it – there wouldn’t be any benefit to do that and I would worry about it being old.